Looking for more control in using free motion quilting designs? 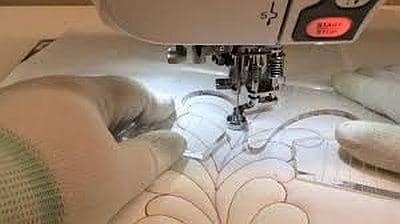 Learn to use templates made for your home sewing machine and see how successful you can be with quilting designs and motifs. The class requires that you have the Westalee Sew Steady Ruler Foot and Template Starter Set. There are six separate templates in the set. The Ruler Foot must be specific to the make and model of your machine. Cindy will demonstrate various techniques, and then you will have time to use them on your own quilt sandwiches. You will learn how effective these new tools can be in quilting your own quilt. If you need to purchase the templates and ruler foot, the staff at Mill House will be happy to help you so you get the correct set and ruler foot. Please place your order three weeks before the class meets so we are sure you have what you need.